I came across this amazing family on You Tube a few weeks ago and ever since after following on social media have been watching a few videos every day to catch up on all the girls adventures. 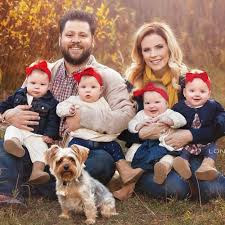 I'm learning more about what Ashley and Tyson went through on their IVF journey with more of the videos that I watch. I've just finished the one where they take the girls back to the IVF clinic to meet the Doctors and Nurses there which is incredibly sweet to watch. If you haven't seen any of the Vlogs head over to you tube and check out their channel. The videos are so well put together and just make you want to find out more and see what the girls are up to. I think it's great to see what the family are up to especially in more recent videos as the girls are really growing up now. I did love the video this week of the girls being introduced to the drone and seeing them call it the Bee. The footage was super cute especially seeing them all wave up at it.